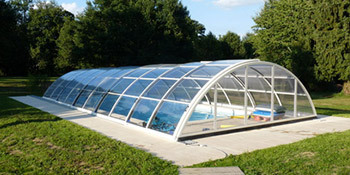 Pool enclosures act as a swimming pool conservatory, giving homeowners the best of both worlds. You’ll be able to enjoy your pool in both summer and winter, without the worries of bad weather affecting your swim. Pool enclosures allow you to use your swimming pool throughout the year and they come at just a fraction of the cost of conventional pool buildings. They provide a sturdy, yet somewhat lightweight structure for you to house your swimming pool. Any type of swimming pool can be enclosed, even difficult sites with poor access. There are a number of designs and you can opt to have a retractable enclosure too, giving you the opportunity to fully enjoy the warm weather when it hits. Pool enclosures often need planning permission, just like conservatories and orangeries. Building Regulations will also have to be met and it’s vital that everything is compliant. A pool enclosure is something that should be considered by everyone owning a swimming pool as the benefits are very rewarding. Pool enclosures give homeowners the opportunity to enjoy their swimming pool all year round and offer a cheaper way to protect your pool. Complete our quick form to receive up to four FREE quotes from local, vetted and reputable companies for the installation of a pool enclosure. Professional and straight forward talking. No sales pitch. Only one company recommended by quotatis, need more to gauge value for money.